When new daily high temperature records overwhelmed low temperature records by well over 20 to 1 in the first 9 days of August, it was impressive enough, but the amazing excess has continued right through the end of the month. The over 3000 daily heat records swamped the 142 cold records by 22.2 to 1. In fact, the excess of heat records over 3000 was more than the total number of cold records! For meteorological summer (June-August) as a whole, the ratio increased to 11.4 to 1 from 8.4 to 1 through July, and the year to date is now at 3.4 to 1, more than 50% above the average for the previous decade. Texas accounts for 1343 of the heat records in August, but Oklahoma, Arkansas, Missouri, and Kansas are also well represented. Despite the moderating maritime influence of the Gulf of Mexico, the 95° at Key West Naval Air Station (KNQX), Florida on the 5th, 10th, and 13th set new records for each date and also tied the all-time highest temperature. In all, Key West set or tied temperature records on 12 days out of the month. The 47 new and 53 tied all-time high temperature records were focused mainly in the first week of the month, but Texas made a strong showing in the final few days, with Ft. Hood breaking its old record of 108° for the second time at 112° on the 27th and then tying it the next day. Houston (109°) and Austin (112°) also tied all-time records. 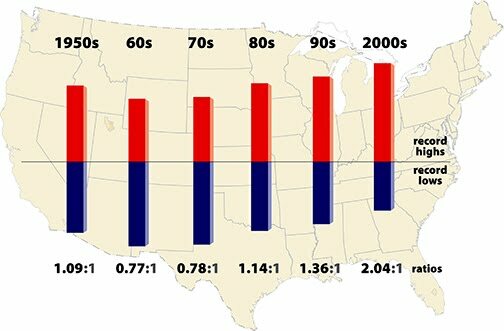 Preliminary data from ESRL/NOAA through August 30 show that temperatures over the entire contiguous U.S. and adjacent Canada were above or within less than 0.5°C of the 1981-2010 average with the exception of immediate coastal California and Washington. 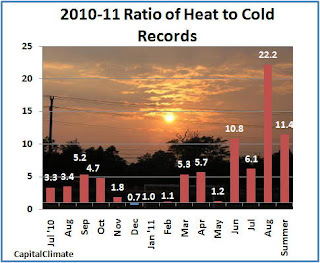 - Monthly ratios of daily high temperature to low temperature records set in the U.S. for July 2010 through August 2011. Data from NOAA National Climatic Data Center, background image © Kevin Ambrose (www.weatherbook.com). Includes historical daily observations archived in NCDC's Cooperative Summary of the Day data set and preliminary reports from Cooperative Observers and First Order National Weather Service stations. All stations have a Period of Record of at least 30 years. GWEN IFILL: As you talk to people, to farmers, to ranchers, to people who depend on rain, do they have any innovative or alternative ideas about how to cope with this crisis, other than to get down on their knees and pray for rain? 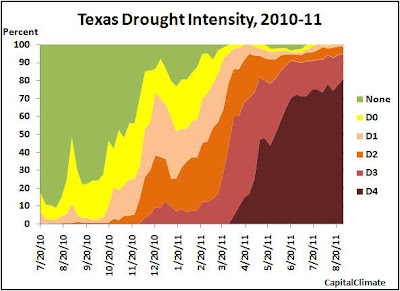 I listened and watched in shock tonight and Gwen Hill and Wade Goodwyn, both whom I have long respected, discussed the drought in Texas puzzled while failing to connect the dots to make the connection between global warming and CO2 production. Wade's only solution was to pray for rain. What has happened to your courage and objectivity? Again, a story on the Texas drought - and not a mention of climate change. Given the position of Governor Perry - that climate science is essentially fraudulent - isn't a question journalistically justifiable. Indeed, demanded? If climate change is no longer a topic that can be credibly raised in the context of some of the worst-ever droughts and floods in the nation's history - major items on the same program - then that's a story all on it's own. Most inane coverage and questioning by Gwen Ifil I could imagine. Worst draught in Texas history, Governor of Texas running for president who doesn't "believe in" global warming. But not one question about climate change and maybe the connection? Why is that? Deployed on an ice floe at the North Pole in Summer 2011 as part of the North Pole Environmental Observatory. In 2011, melt was very rapid in July, and the web cam tipped over on July 23 in the melted snow and ice. Update: In addition to the 18 all-time records on August 28, there were 24 more which set new daily records for any date in August. The St. Johnsbury climate record extends back 118 years. Dr. Jeff Masters also reports that the 11.23" of rain at Mendo, Vermont "was the greatest single-day rainfall in Vermont's history, according to wunderground's weather historian Christopher C. Burt, beating the 9.92" that fell at Mt. Mansfield on 9/17/1999 during the passage of Tropical Storm Floyd. The 13.30" that fell on East Durham, NY during Irene was just shy of New York State's all-time 1-day rainfall record: 13.70" at Brewster on 9/16/1999, from Tropical Storm Floyd." CNBC this afternoon reported that Hurricane Irene's economic impacts are likely to reach $7 billion, of which only $3 billion are covered by insurance. Out of 10 extreme weather events this year each costing a billion dollars or more, Irene ranks second or third. Worldwide, the first 6 months of 2011 have already broken the record for natural disaster losses. 4:30 PM CDT Update: No more calls, please, we have a winner. Today is the hottest August day ever in the Austin daily climate history which dates back to 1898. The 112° temperature at 2:26 pm was the highest ever in August and tied for the highest all-time temperature (see below). It also smashed the previous record for the date, set in 1924 and tied in 1990, by 8°. The high temperature of 110° at San Antonio not only crushed the daily record, set in 1940, by 9°, it also broke the August record by 2°. The all-time record at San Antonio was 111°, also on Sept. 5, 2000. San Antonio climate records began in 1886. While Hurricane Irene has been hogging the limelight, the record rampage of 100° temperatures goes on in Texas. The high of 110° at Austin on Saturday (August 27) tied the all-time August heat record, and the current temperature (3 pm CDT) has at least tied the record again. This raises the annual count of 100° days to date to 73, which is 4 more than the previous record. The all-time high temperature at Austin was 112° on Sept. 5, 2000.